The facility failed to meet nine out of 10 standards in a recent HIQA inspection. 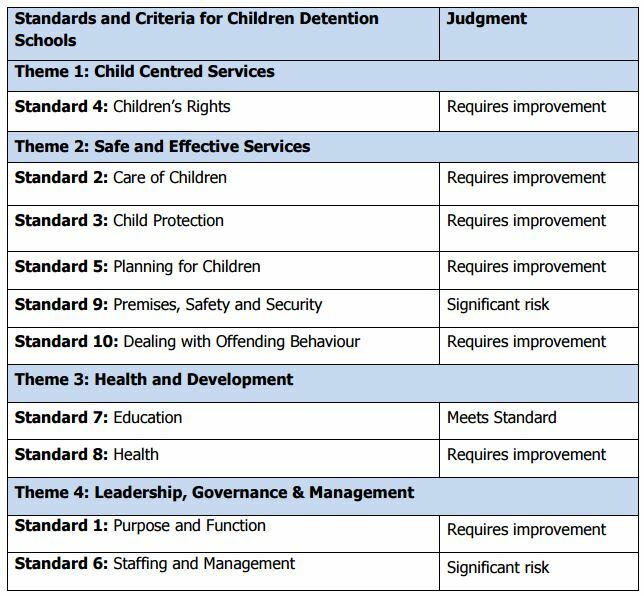 AN INSPECTION OF the controversial child detention facility at Oberstown by health watchdog HIQA (Health Information and Quality Authority) has found that the centre failed to meet nine out of the 10 standards by which it was evaluated. The facility has been criticised for several incidents, including one in which a boy was placed in ‘single separation’ for a period of 27 hours over the course of three days. The report found that instances of single separation were not consistently authorised or documented. The pre-announced inspection was carried out over four days last November at the facility in north Dublin. At that time 47 boys and one girl between the ages of 10 and 17 were resident at the centre. All told, the centre failed to meet nine out of the 10 standards by which it was measured. Seven of those standards were deemed to ‘require improvement’, while two, that of premises, safety, and security, and staffing and management, were found to pose a ‘significant risk’. Fianna Fáil spokesperson for children and youth affairs Anne Rabbitte today called for the deficits noted by HIQA at Oberstown to be addressed by children’s minister Katherine Zappone. “There are still significant trust issues between management and staff at the facility,” she said. An especially worrying finding in this report is that that the facility has to frequently be put on lock down – with children confined to their rooms – due to staffing shortages. Meanwhile, children’s ombudsman Dr Niall Muldoon has declared the HIQA findings to be “not good enough”. “The impact of staff shortages is abundantly clear throughout this report. While it is evident that the staff in place are doing a very good job with the resources available, it is clear that shortages are making it more difficult to build relationships with children,” Muldoon said. It is still not good enough that the facility was found wanting in nine out of ten areas. Oberstown is a state of the art facility and a massive improvement on St Pat’s, an unsuitable campus which the Ombudsman for Children Office campaigned long and hard to see closed. We must see significant improvement across all of these areas in Oberstown. Oberstown has been the scene of a number of days of industrial action in recent times over safety concerns concerning staff. Those strike actions have been based on ‘management’s refusal to refusal to adequately address serious health and safety concerns highlighted by workers’ according to union Siptu. Yesterday, Siptu announced once again notice of pending industrial action following staff’s decision to reject recommendations from the Workplace Relations Commission regarding health and safety at Oberstown. “Our members are at daily risk of serious injury,” said union spokesman Ray Stanley. They have on numerous occasions over the last 15 months, along with their colleagues in Impact, raised concerns regarding health and safety issues with management. These concerns have not been adequately addressed. This situation must change so that a positive solution can be found for the workers and the young people they care for. HIQA’s report can be read here. Email “Child left in isolation for 27 hours at controversial detention facility”. Feedback on “Child left in isolation for 27 hours at controversial detention facility”.